It is amazing how time flies. 30 years ago we were stationed at Scott AFB, Illinois. Going to 'The Magic House' in the mid 80s was a big deal, a lot of fun. It meant it was a great day to be a kid! This weekend I took my own kids for the first time. As we traveled from Fort Leonard Wood to home (NE Ohio) I wanted to show them the sites, give them a glimpse of where I lived for a few years, let them soak up some of the things I did and saw when I was their age. I had a little bit of fear. I wondered if I had made The Magic House so much better in my mind over the years. I wondered if maybe the museum had changed over the years, maybe not for the better. I hoped I could even find it! It blew my expectations away. As a family, we laughed, we learned, we connected. Hubs got into the construction zone with the kids, hard hat and all. 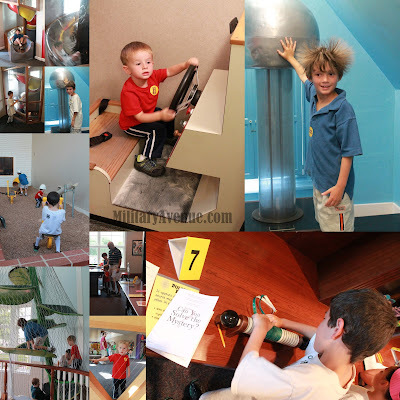 I walked along side the 'Mystery' center with my 10 year old and we worked through it together. The boys slid down the three story slide and we all laughed so hard that I almost peed my pants. Some things have changed. There was no longer a maze that gave you the perception of being blind. My brothers and I remember that being very scary and yet it got us thinking about the gift of site and has stuck with us through the years! There is now a cool 'Jack in the Beanstalk' ladder that the kids take from one floor to the next, and to the next. That is definitely new. I am no longer 10 but quickly approaching 40. That has definitely changed. Some things are the same. My son's hair stuck out like crazy at the static ball, just like mine did so many years ago. The three story slide now says 'Not recommended for Adults' and my mom remembers my aunt going down it in the 80s, head-thunking on the slide the whole time. (Perhaps she is the reason it is no longer recommended.) The laughter that emanates through the place has definitely not changed over the years. The Magic House is part of the Blue Star Museum program. This was a surprise to us! As we walked up to get our tickets hubs asked on a whim if they offered a military discount (He never does that; I was so surprised!). I was even more surprised when the friendly clerk said 'YES! We will give you up to five tickets for free. Wow. That kind of support blows you away, especially when you don't expect it. 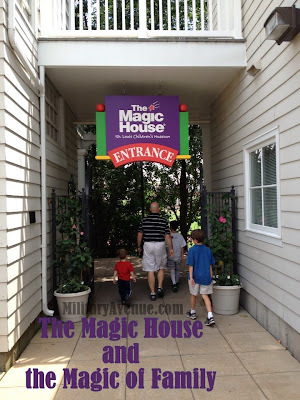 Thank you to The Magic House for a day of fun for this military-family and thank you again to Blue Star Museums for making this very fun summer museum program a reality. That place sounds like fun! 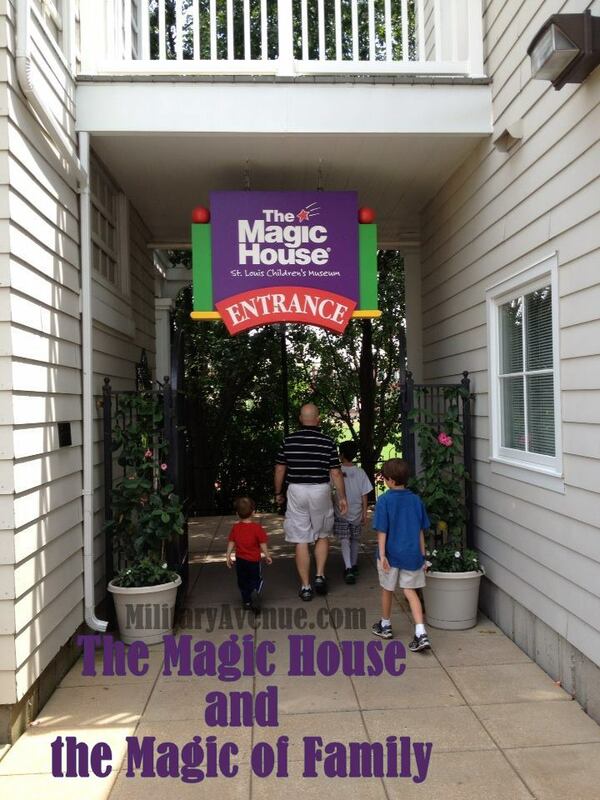 What a fun time and yes, what great memories at The Magic House. Thank you to Blue Star Museums! On the Road Again, A Military Journey!